(Bloomberg Opinion) -- Chinese carmakers may have found the secret to survival. Their foreign rivals should beware. As manufacturers rush to meet the requirements of China’s policy to promote electric cars (known in the country as “new-energy vehicles”), locally-owned automakers have been busily accumulating special credits, which are awarded for how many electric cars they make and for cutting fuel consumption in their combustion engine vehicles. As a big carmaker, you need a certain number of these green credits to comply with China’s regulations. At least 10 new-energy vehicle credits are required for every 100 combustion engine cars made, or thereabouts. Data published last week showed that of the 22 million domestic-made cars last year, the industry as a whole managed to get 17.5 credits per 100 cars, well ahead of the requirements for this year and next. But local manufacturers are doing far better than foreign automakers operating in the country. Chinese brands such as as the Warren Buffett-backed BYD Co., Geely Automobile Holdings Ltd. and SAIC Motor Corp. scooped up 96 percent of the new-energy vehicle credits. Foreign carmakers, meanwhile, have struggled. So while SAIC generated more than 300,000 of these types of credits (equivalent to half its total car production), its joint ventures with Volkswagen AG and General Motors Co. generated just 20,000 to 30,000 of them, equal to slightly more than 1 percent of their output. Foreign automakers – which have been much slower to make the shift away from combustion engines in China than the domestic companies – were short on fuel consumption credits too. Loosely based on California’s zero emission regulations, China’s system stipulates that companies with a yearly output of at least 30,000 units must earn new-energy vehicle credits equivalent to at least 10 percent of their production and imports of conventional cars. This will rise to 12 percent next year. For now, since there’s an oversupply of these credits, they are worth zero in theory, according to UBS analysts. But that doesn’t mean they’re worthless to the industry. 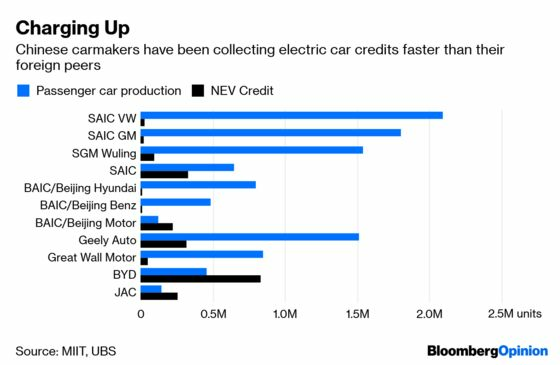 The electric car credits can be used too to offset any shortage of fuel consumption credits, which makes them potentially very useful (maybe even crucial) to the foreign carmakers, given their relative slowness in shifting to electric vehicle production in the country. Indeed, the hoarding of credits by the large domestic manufacturers may give them more bargaining power in the next stage of development in China’s car industry. They could use their stash as leverage with foreign partners as the latter try to increase their holdings in local joint ventures. After new rules removed the cap on overseas ownership last year, BMW AG has raised its stake in its local venture. Daimler AG and Volkswagen are considering the same. 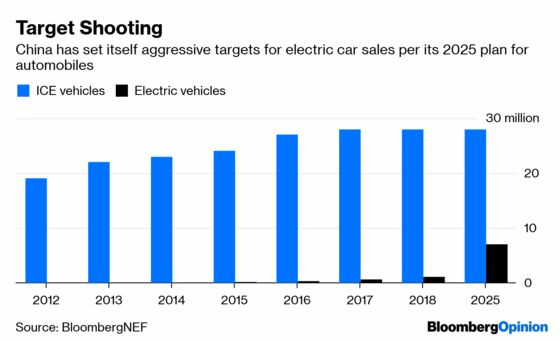 The western carmakers certainly won’t want to be held back by their inability to generate enough green credits in their quest to conquer one of the few large markets where electric cars are a central government focus. Despite a sharp slowdown in China’s car sales of late, it has also been a source of growing profits and fatter margins for international companies. With more stringent requirements on subsidies, the pace of credit-gathering will slow but local manufacturers will probably maintain their lead. Foreign carmakers need to respond. Smaller carmakers only need to hit fuel consumption credit targets.